Just how much is a selfie worth? 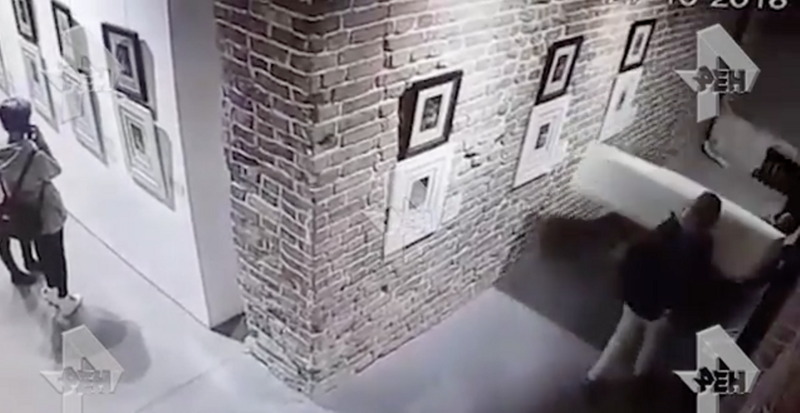 A few dozen likes, some positive comments, an original Salvador Dali etching...Well, a group of Russian women may be about to find out after accidentally damaging artworks by both Dali and Francisco Goya in Yekaterinburg while posing for photos. The four women, from the city of Chelyabinsk, were part of a tour visiting the Glavny Prospect (Main Avenue) International Arts Centre on 27 October. CCTV footage shows a stand displaying Goya’s Bravissimo! (1798) etching from the Los Caprichos series and Dali’s interpretation of the engraving titled No suddenly topple over, narrowly missing one gallery-goer. One of the women can be seen in a state of shock on the other side of the partition before a crowd gathers. According to the police, Goya’s work is largely undamaged aside from its frame and glass cover, but Dali’s print suffered a cut 10cm long. The centre described the women as “not very well behaved” but has reportedly opted against opening a criminal case. “Three women who, during questioning, explained that the stand was touched by accident as they tried to take a photo with the paintings in the background,” Irina Volk, a representative from Russia’s Interior Ministry, told Russian media. The centre said that the works are currently being inspected to evaluate the extent of the damage. “[The incident] didn’t affect the activity in the exhibition or the flow of visitors,” an employee told the Tass News Agency.